Does out of sight mean into the air or into fish? I don’t do San Francisco like most people. I skip the cable cars, Lombard Street, Alcatraz, and the fine restaurants and museums. Soon after my flight arrives, I drive my rental car north over the Golden Gate Bridge and hike uphill a half-mile where I am rewarded by breathtaking views of the Pacific Ocean and steep slopes filled with dry grasses and brilliant green vegetation. But that’s not what I’m after. I trek a mile farther down a treacherous slope to a small beach, where I find what I’ve been seeking. Rocks. Rocks with oil on them. Next I drive to a popular coastal walkway to peruse more rocks. 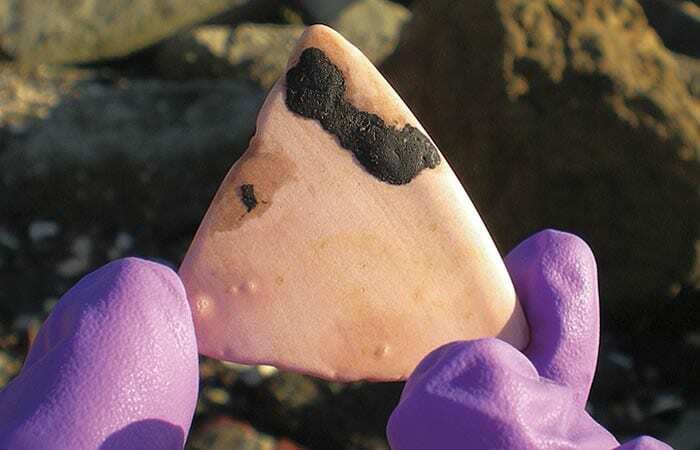 The following day I visit a local marina and one of the largest dog parks in the United States, where, in addition to rocks, the shoreline is covered with hundreds of broken ceramic dishes—remnants of a ceramic factory closed in the late 1960s. I’ll collect anything with oil on it. On the third day, my search takes me by ferry to Angel Island. I walk briskly around the island’s perimeter and make it back to the ferry just in time to catch the return trip to San Francisco. And then to the airport. I know the routine well. I’ve done it half a dozen times. 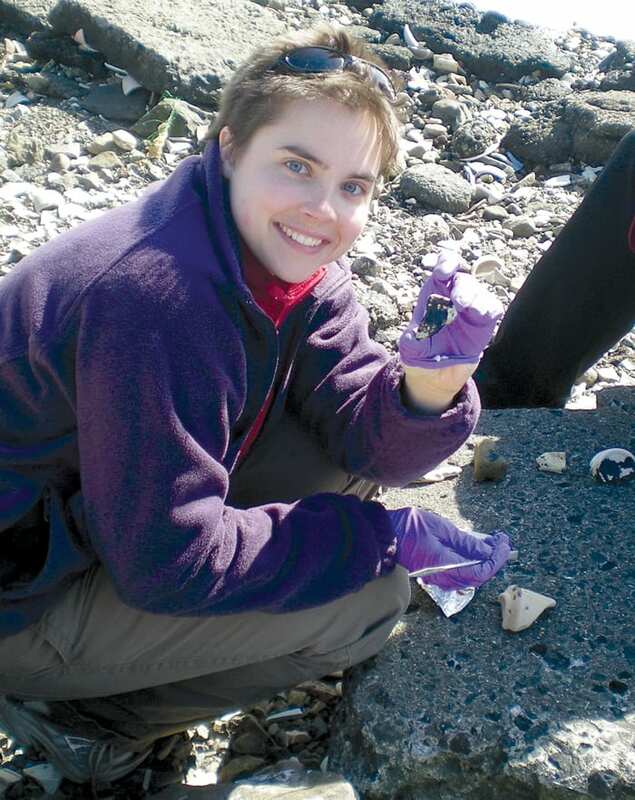 At each stop, I pull out purple gloves and foil envelopes and scour the shoreline for oil samples. Passersby offer me quizzical looks; a few stop to ask questions. If my intense staring at rocks and searching in every nook and cranny doesn’t get their attention, the purple gloves do. 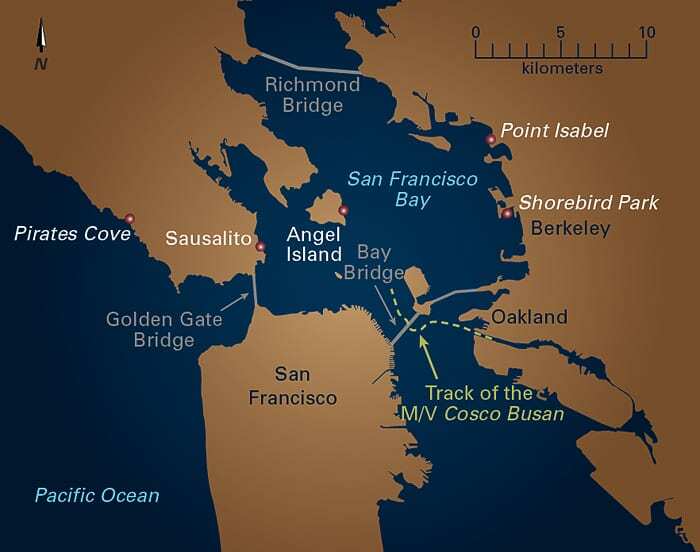 The oil I’m looking for on the shores of San Francisco Bay was spilled in November 2007 by a container ship, the M/V Cosco Busan, after it struck the San Francisco-Oakland Bay Bridge. The spill released tens of thousands of gallons of heavy fuel oil into the bay, leaving a dirty bathtub ring of oil along its rugged shores. The spill affected more than 100 miles of coastline. It killed more than 2,000 birds and may have caused a devastating decline in local herring populations that resulted in the first closure of the bay’s only commercial fishery. No one can say with certainty whether this decline resulted from the spill or from natural causes. One way to explore this question is to look closely at the oil itself to understand its potential toxicity over time. Once released into the environment, the various compounds within an oil can evaporate, dissolve into surrounding waters, be eaten by microorganisms, or be broken down by sunlight. How these so-called “weathering” processes affect different compounds depends on the individual compounds’ physical characteristics, including their size and chemical structure. That’s where I come in. That’s why my suitcase is always filled with oily samples when I leave San Francisco. Back at the Woods Hole Oceanographic Institution, I am using novel techniques to study the diverse chemical compounds that comprise spilled oil, with the goal of more fully understanding what happens to them after a spill. Oil is an intimidating mixture of thousands of compounds, and every oil is different. All petroleum-based fuels, including the gasoline we pump into our cars, begin with crude oil that is pulled from the ground and processed at a refinery, where it is heated and separated into the different products we use. As crude oil is heated, lighter compounds evaporate and are collected and sold as gasoline, jet fuel, kerosene, diesel fuel, and lubricating oil (motor oil). At the end of this distillation process, there remains a thick residue of heavier compounds that were not evaporated off during the refining process, called the residuum. Heavy fuel oil is made from the residuum by “cutting,” or adding one of the lighter fuels (such as diesel) to thin the residuum and make it easier to use. Since every residuum is different and the type and amount of cutting oil varies, there is no standard heavy fuel oil. Individual components in this complex mixture of oil behave differently in the marine environment and determine the environmental impacts the oil will have. Heavy fuel oils are used to power the container ships that carry most of the goods traded in our global economy. The continued use of these fuels is currently under debate. Because of the high sulfur content of the residuum, burning heavy fuel oils results in more harmful emissions than alternatives such as diesel fuel. In fact, one study estimated that decreased air quality from burning heavy fuel oils is responsible for approximately 60,000 deaths worldwide each year, primarily in coastal Asia. In the past decade countries have begun instituting emission control areas (ECAs). These areas have strict emission regulations and severely limit, among other things, the sulfur content in fuels. These ECAs aim to reduce or ban the use of heavy fuel oils, particularly in coastal areas, in favor of more expensive biofuels or diesel-range products with lower sulfur content. However, even with the expansion of ECAs, the use of heavy fuel oils is on the rise as international trade increases. Accidents are inevitable. Few heavy fuel oil spills have been well-studied, and understanding how these types of oil weather is critical for targeted oil spill response and cleanup efforts, as well as for informing discussions on their continued use. The M/V Cosco Busan spill involved a heavy fuel oil, a fact that made it worth my while to pack my purple gloves and head west. Among the potentially harmful compounds in heavy fuel oil are naphthalenes. You may already know of naphthalenes from the mothballs in your closet. Naphthalenes in heavy fuel oils come from the cutting oils used to make them. 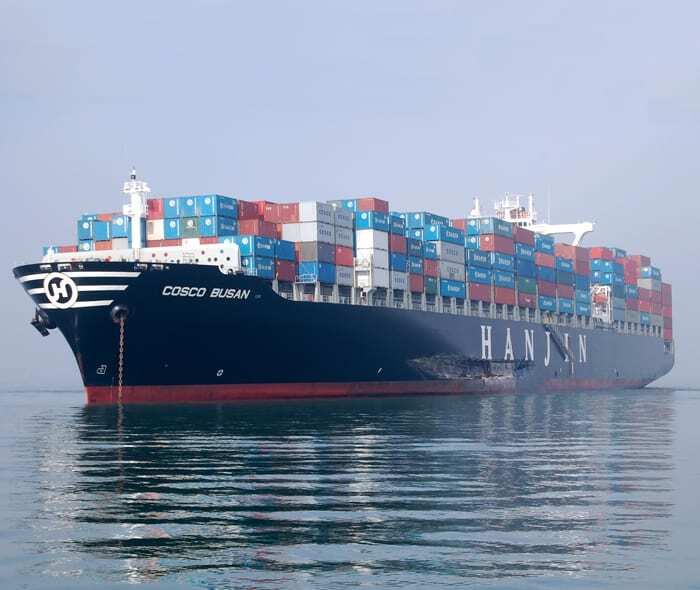 From analyzing my oily rock samples, I know that naphthalene concentrations within the beached Cosco Busan oil decreased dramatically during the initial days after the spill and are still decreasing slowly in later samples. That might seem like a good thing. But where did these compounds go? Smaller low-molecular-weight compounds, such as naphthalenes, are particularly susceptible to the processes of evaporation and water washing. Evaporation moves compounds from the oil into the atmosphere; water washing occurs as waves wash over oil exposed on rocks and compounds are dissolved into surrounding waters, exposing marine plants and animals to their potential toxicity. Because evaporation and water washing both act on low-molecular-weight compounds, distinguishing their effects is not easy, and traditional oil spill studies rarely attempt to do so. The likelihood that a compound will move out of the oil and into air or water is closely tied to the compound’s weight and polarity. But among smaller compounds, those with higher polarities are more likely to be transferred into water. Polarity is a property determined by how electrons within the atoms of a compound are arranged. 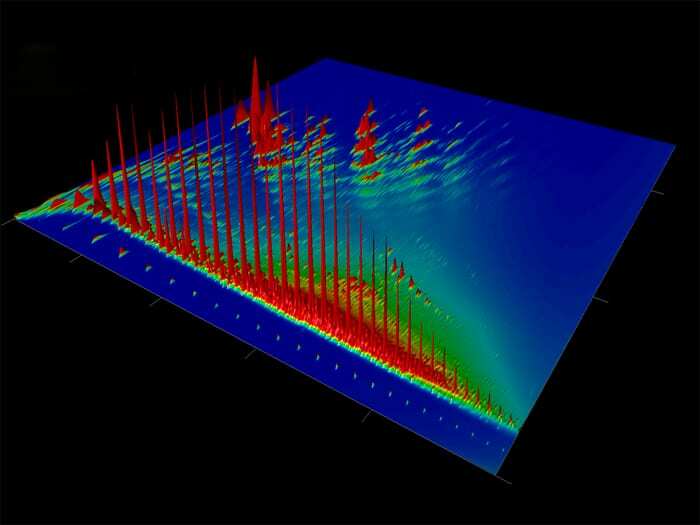 In polar compounds, electrons are not uniformly distributed across the compound’s structure. That gives certain parts of the compound more positive or negative charges, making them more likely to dissolve in water. To more accurately track the fate of compounds after the Cosco Busan spill, I am using a technique called gas chromatography. This method separates compounds in a mixture by taking advan­tage of individual compounds’ unique properties, such as their weight and polarity (see diagram below). In 2010, we published a study in the journal Marine Pollution Bulletin in which we used gas chromatography to look at the weathering of the oil after the M/V Cosco Busan spill. We looked at compounds within the oil that we know behave in particular ways in the environment and learned about the impacts that microorganisms and sunlight had on our oil samples. But we were not able to clearly distinguish between the impacts that evaporation and dissolution had on the oil. Eager for a clearer picture, we decided to go a step further. I am now adding a second dimension to our gas chromatography analyses, using a second column to separate compounds based not just on their weight but also on their polarity. So now I can calculate the percentage of each individual oil compound that is likely to dissolve into the water or evaporate into the atmosphere. I am still analyzing samples from San Francisco Bay and calculating sizes and polarities for each chemical compound within Cosco Busan oil. When I’m finished, we should be able to predict where each of the compounds within the oil went—into the atmosphere or the water. Then, we will have one more piece of the puzzle to help us understand what’s happening to the San Francisco Bay herring populations and one more tool we can use to study future spills. Maybe then I can return to San Francisco and see the city like a normal person. This research was funded by the Richard and Rhoda Goldman Fund, the Coastal Ocean Institute at WHOI, the Ocean Ventures Fund, and the Seaver Institute. The gas chromatograph instrument consists of a syringe injector, a column, and a detector. The column consists of a long glass tube as thin as the lead in a mechanical pencil. The tube’s interior has a chemical coating. A mixture of compounds is injected into one end of the column. As compounds travel through the column, each compound interacts differently with the chemical coating, depending on its unique properties, and proceeds through the coating at its own pace. 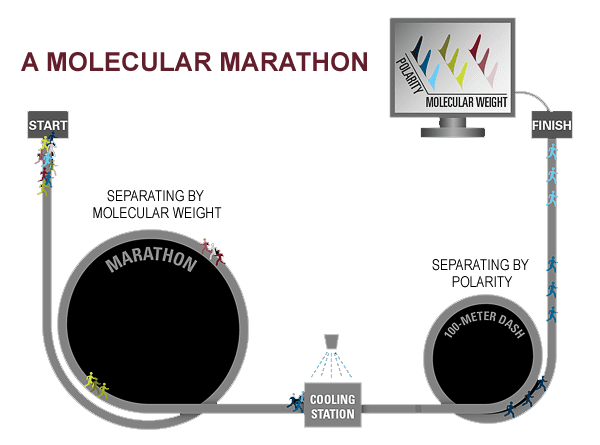 But just as 15 people carrying the same weight can run a marathon in the same time, 15 compounds with similar weights can travel through a column at the same speed, and 1-D chromatography can’t separate them. So we send the compounds through a process called comprehensive 2-D chromatography—a second column that separates them by a second dimension, their polarities. Think of it this way: The runners with the same weights who finish the marathon at the same time, then run a 100-meter dash, to distinguish them by how much of a kick they have left. 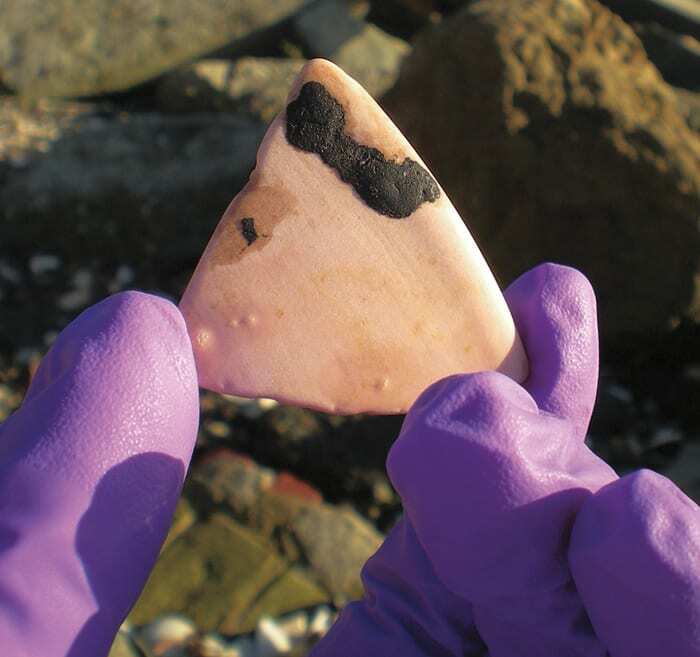 MIT/WHOI graduate student Karin Lemkau collected samples of oil from the Cosco Busan spill that remained on rocks in several locations in the San Francisco Bay area. She has been analyzing them to learn what happens to various chemical compounds in the oil after it is released to the environment.